Artist Douglas Coupland’s latest work, Vortex, a 50,000-litre environmental art installation comprised of plastics found in the ocean, including a Japanese fishing boat – lost during the tsunami in 2011 and found on the shores of Haida Gwaii in 2017 – is seen at the Vancouver Aquarium on May 15, 2018. Céline Cousteau is an ambassador for the TreadRight Foundation. Since 2007, I’ve been visiting the Vale do Javari Indigenous reserve deep in the heart of the Brazilian Amazon for my film and protection campaign Tribes on the Edge. There, I’ve seen what it is to live a non-disposable lifestyle. There it becomes easy to appreciate just how much unnecessary waste we are creating on a daily basis and how simple it could be to make more sustainable life choices with our use of everyday objects and materials if we really want to. While it is the responsibility of government and private-sector companies to come together and change product design by depressing the non-essential use of plastics, the choices we regularly make as individuals going about our days are absolutely integral to pushing back against the plasticization of our oceans. Canada has said it plans to make plastics one of the key themes at the Group of Seven leaders’ summit in Charlevoix, Que., next week, and last fall, Canada signed on to the United Nations Clean Seas campaign, launched in February, 2017, to draw public attention to the enormous amounts of garbage that are ending up in the world’s oceans. Canada has even committed as much as $2-billion to ocean protection, including vital initiatives such as increasing the amount of protected marine areas. These are the kinds of moves that inspire hope in the face of a massive adversary. Plastics are a clear and present danger to the future of our planet. The numbers are staggering. An estimated eight million tonnes of plastic, the equivalent of approximately 630 billion single-use plastic water bottles, finds its way into our oceans every year, posing a deadly threat to marine life. At the moment, more than five trillion pieces of plastic litter the oceans. A report launched at the World Economic Forum in 2016 stated that if nothing was done by 2050, there would be more plastic in the oceans than fish. While the issue of larger, visible pieces of plastic cropping up on our shores, piercing the insides of seabirds, drowning whales and dolphins and choking sea turtles is undeniable and persistent, the much smaller fragments – commonly referred to as microplastics as they are measured in mere millimetres – represent an even more significant threat to the health of our oceans and, therefore, the whole planet. These microplastics are being accidentally consumed by marine life, poisoning entire systems as they break down and release toxic chemicals. Solutions to the plastic problem are twofold. First, there is the removal of the plastics currently overwhelming our oceans. Second – and, I believe, most importantly – we must stop plastics from getting into the oceans in the first place. 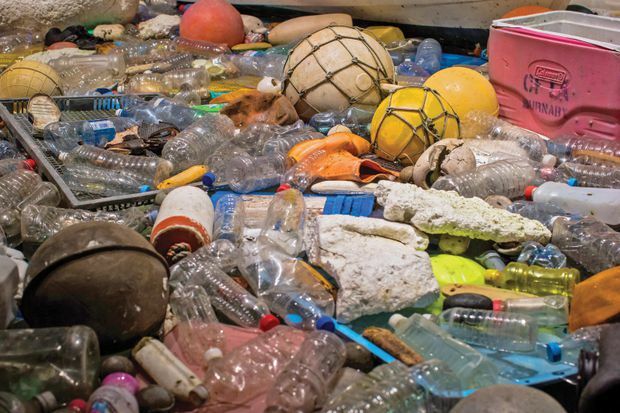 It should be noted that Canada’s high-level initiatives in ocean protection as they relate to plastics aren’t the only space in which Canadians have assumed the pole position when it comes to the ocean-plastics problem. Canadians also lead the developed world in per-capita production of garbage. Yes, it’s true, when it comes to absolute consumerism excess and waste, Canadians are the current worldwide gold standard, generating 720 kilograms per capita of waste annually. That’s estimated to be twice that of Japan, and 7 per cent higher per capita than the United States. Individual Canadians now need to follow the example Canada has set on the international stage. While there’s no denying plastic has become an integral part of our daily lives throughout the developed world, the reality is that we all need to make real changes in the way we live our lives if we hope to solve the problem. We need to find ways to push back against the trend toward the disposable in our society. The good news is that there’s no shortage of easy-action, ocean-friendly solutions available to you, starting with rejecting the notion that single-use plastics are a necessity in our daily lives. It continually boggles my mind how quickly we came to embrace the ludicrous notion that we should be using anything just once and then tossing it away. Single-use plastic water bottles, disposable plastic wrapping for leftovers or lunch, takeaway coffee cups, straws and plastic shopping bags are just the start. Plastics are so pervasive in our modern lifestyles that there’s almost nothing you can point to that doesn’t, in some way or another, use disposable plastics. Although recycling represents a partially viable solution, much like our oceans, our plastic-fuelled lifestyles have made it so that even our recycling programs are drowning in way more plastics than they were ever intended to deal with. Plastics have always been more challenging and more costly to collect, sort and recycle than paper. With China, formerly the world’s largest importer of recyclables, now placing a ban on certain recyclable imports as of this past Jan. 1, the global recycling industry has been upended and recycling programs around the world are feeling the effects, forcing a number of programs to resort to burning their recyclable plastics or simply sending them to landfills. Just because you popped it in the blue bin doesn’t mean it’s not still going to find its way to the sea. While recycling has long been the “R” that gets the most attention when it comes to the Three R’s of Sustainability, it’s the other two – reduce and reuse – that we will need to focus on if we hope to help stop the deluge of plastics into the oceans. Realistically reducing plastics means consuming consciously. I find it helpful to keep in mind that, in reality, there is nothing actually disposable about plastics. Every single piece of plastic we have ever created is still with us now. Plastic’s indestructible nature has helped to make it pervasive in the things we use, but it also means it’s not going to break down anytime soon. Keeping that fact front of mind as you make purchasing decisions helps you to contextualize the effects of your decision and to make smart ones. Being aware that the flimsy plastic bag you tear off the roll to throw your tomatoes into at the market (and oh hey, look at that tiny plastic sticker on every single tomato) will be hanging around for at least the next 1,000 years, with no other purpose to serve than having encased your tomatoes for the duration of the journey from the market to your fridge, makes it easier to simply leave it on the roll. That line of thinking should also help you make adjustments in your life when it comes to reusing by reinforcing the importance of bringing your own reusable shopping bags to the store, carrying a reusable water bottle, bringing your own cup to the office and packing lunch and storing leftovers in reusable containers. It’s not just at home, either. Working as I have with travel companies on their sustainability initiatives through the years, it has become clear to me that we are even more willing to embrace the idea of single-use waste when travelling. On average, for just a two-week trip, at least 30 plastic bottles are used per person. Multiply that by the 12 million-plus Canadians travelling abroad annually and you start to get an idea of the kind of damage being inflicted on places that are often even more ill-equipped to deal with plastic waste than where we’ve travelled from. At least with your blue bin, the plastic waste has some chance of serving a second purpose. The same can’t be said of the water bottle you’re tossing aside as you explore a new country. Canada is incredibly well-positioned to help save our oceans from plastics, but until individual Canadians work to cure themselves of their plastic addiction, Canada will have failed to effectively pick up the torch. Don’t get in your own way on plastics, Canada. The world is looking to you – every single one of you – on this one. Can Canada reinvent the plastic economy?